Detroit Carriage Co.; Detroit Body Co. Located in the historic Hamtramck village of Detroit, the Detroit Carriage Company is best remembered as a production body builder for early Oldsmobile and Cadillac automobiles. Along with the C.R. Wilson, and Monroe Body, Detroit Carriage built large numbers of bodies for Cadillac and during the next decade, they built thousands of open production bodies for many Detroit manufacturers including Oakland and Hudson. Herman Roehm, the firm’s president, was born in Germany on October 28, 1837 to John David and Elizabeth C. Roehm. The family emigrated to the United States 1847 and found their way to Detroit where young Herman completed his education. Roehm was not a coachbuilder by trade, having entered the business first as a bookkeeper, then as owner of a hardware company. After a false start working in the jewelry business, Roehm ended up keeping the books for a large Detroit hardware store, eventually becoming a junior partner as Radcliff, Roehm & Weston. In 1867 Herman and his older brother, Robert John Frederick Roehm, took over the firm, first reorganizing it as Roehm Bros., then in 1871 with a third partner, Сlement Аugustus Davison (born in 1849), as Roehm & Davison. The firm specialized in wholesale carriage goods and was located at 71-73 Jefferson Ave. in downtown Detroit. In the early 1900s they relocated one block away, at 91-95 W. Woodbridge St. and built a large warehouse at 3289 Beaufait St.
Roehm & Davison advertised themselves as “mfrs. and jobbers top fabrics, curtain fasteners, celluloid, buttons and tacks, leather, carpet, bows, hair, webbing, etc.” Capitalized at $200,000, the firm was incorporated in 1901 as Roehm & Davison Ltd. Officers of the firm were Herman Roehm, president; С.А. Davison, vice-president and treasurer; Сharles М. Roehm (Herman’s son), general manager; J.A. Goodwillie, secretary; and С.В. Noyes, head of the automobile dept. In 1886 Herman Roehm and William D. Rumsey organized the Rumsey Manufacturing Company in order to manufacture wholesale carriages in-the-white that could be distributed through Roehm & Davison. The Rumsey Manufacturing Company of Detroit was unrelated to the substantially larger L.M. Rumsey Manufacturing Co. of St. Louis, Missouri and Seneca Falls, New York, a manufacturer and distributor of fire apparatus, brass bells, hardware and plumbing fixtures. Another son of Herman’s, Albert H., would soon become the driving force in his father’s new company. Albert H. Roehm, was born to Herman and Caroline (Rich) Roehm on Dec. 5, 1863. When he turned 16 he initiated his business career with his father’s firm, Roehm & Davison as the firm’s city buyer. In 1881 he left the employ of his father to become an entry clerk in the wholesale hardware establishment of Ducharme, Fletcher & Company. One year later he accepted a position with W. H. Edgar & Son, wholesale dealers in sugars where he served as shipping and billing clerk until 1885, when he left to work in the stock rooms of the Detroit Electrical Works. In 1887 Roehm was promoted to the position of general inspector in the firm’s manufacturing department. He left in 1889 to become assistant superintendent in the factory of the Rumsey Manufacturing Company, a firm organized by William D. Rumsey and his father in 1886 to manufacture wholesale carriages in-the-white. Albert was also active in other firms; he was vice-president of the Northwestern Foundry and Supply Company; secretary of the Bellevue Pipe and Foundry Co. of Bellevue, Ohio, secretary of the Spider Lake Mining Company of Ontario, Canada, and secretary and director of the Michigan Storage Battery Company, of Detroit. The Rumsey Manufacturing Company’s officers included; Herman Roehm, president; William D. Rumsey, vice-president; Henry H. Brown, secretary; and Charles Kellogg, treasurer. The factory was located at the corner of Clay Ave. and St. Aubin Street adjacent to the tracks of the Grand Trunk Railroad in the Hamtramck district of Detroit. The firm’s 30 workmen produced carriage and buggy bodies and other parts in the white,—that is, to be finished by other manufacturers. The original Rumsey factory was partially destroyed by fire in October, 1889, and in March of the following year a new modern plant was completed that provided space for as many as 75 hands with an annual production of several thousand vehicles. In 1898 the plant and business was turned over to the newly organized Detroit Carriage Manufacturing Company which was established with a capital stock of fifty thousand dollars and with officers as follows: Herman Roehm, president; Daniel S. Giles, vice-president and manager; George E. Moody, secretary and treasurer and Albert H. Roehm, superintendent. The new firm continued to engage in the manufacturing of high-grade carriages, in the well equipped plant which was leased from Rumsey Manufacturing. Within the first year twenty thousand dollars were expended in the erection of a large addition to the original building, and by title to the plant and property was soon purchased from its former owner, William D. Rumsey. In 1903, the firm was incorporated for $50,000 as the Detroit Carriage Co. whose officers were now: Herman Roehm, president; Henry W. Paton, vice-president; and Albert H. Roehm, treasurer. In 1907 Paton became the firm’s secretary and Albert H. Roehm treasurer and general manager. In 1910 the capital stock of the firm was increased from $50,000 to $100,000. Henry W. Paton was born in Macomb county, Michigan, in the village of Armada, on November 1, 1866, to the Rev. John H. and Sarah (Wilson) Paton. After a public education in the Altamont schools and a course in the Michigan State Normal School at Ypsilanti he engaged himself in the general merchandise business in Almont from 1882 until 1890 when he found work in Ypsilanti. In August, 1892, Paton moved to Detroit to become the bookkeeper for the Rumsey Manufacturing Company, later assuming a similar position with its successor, the Detroit Carriage Manufacturing Company, of which he was made general manager in April, 1900. The plant employed 125 hands, and its average annual wages exceeded $65,000. The firm’s auto bodies were in great demand across the country although the greater part of its output was utilized in Detroit, the recognized hub of the automobile industry. The machinery, stock and other apparatus of the Budd’s Detroit facility was relocated to Philadelphia and their former general manager, Theodore H. Millington, was hired by Detroit Body in the same capacity. While working for the firm, Millington received a patent for a touring car body with a bi-lateral tunnel molding that ran along it hood and back into the cowl. Millington also proposed that the firm build a cyclecar of his own design called the Spider. A prototype of the car was built during the fall and featured in the March, 1914 issue of Motor Print magazine, but during the lapse in time it took to publish the article, Millington resigned from Detroit Body and took a job as the Detroit representative for the Pressed and Welded Steel Products Co. of New York City. By that time the Roehm family had disposed of their shares in the firm to a body engineer named Herman C. Maise, who also took charge of the factory. The revamped board of directors elected Henry W. Paton, the firm’s former secretary and vice-president, president with Maise, William A. Kirby, and Parker O. Pennington rounding out the firm’s executive board. 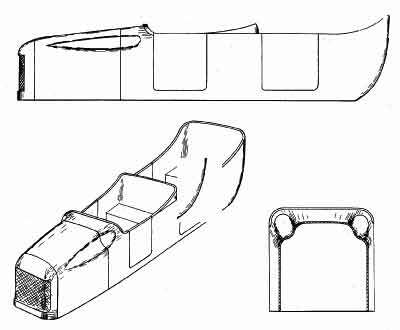 Maise was a well-known body engineer and draftsman who had previously worked for Fisher Body, W.F. Stewart Co. (in Flint, Michigan) and Sievers & Erdmann. Just prior to Detroit Body’s bankruptcy he left the firm to become the chief engineer and factory manager of the Springfield Metal Body Corp. The two-year old Springfield, Massachusetts body builder did not survive the economic depression of 1917 and Maise returned to Detroit to take a job at Briggs Mfg. where he eventually became its vice-president and general manager. While at Springfield Metal Body and Briggs, Maise received 32 patents for his auto body improvements, designs, hardware and improvements. He left Briggs in 1929 to produce his own patented stamped-steel oil burners but unfortunately his new firm didn’t survive the Depression and the assets of the Maise Corporation were purchased by Detroit’s Kelvinator Corporation in 1932. Within a year of the Budd-Detroit Body announcement, the distribution deal turned sour and despite existing contracts with both Hudson and Oakland, Detroit Body was soon facing receivership. The April 28th, 1915 issue of the Horseless Age announced the firm’s voluntary filing for bankruptcy. Judge Tuttle of the United State District Court, declared the firm bankrupt and a receiver representing the firm’s chief creditors was appointed. At the time of filing, the firm’s majority stockholders were Henry W. Paton, Porter J. Tucker, William Blanck, Parker O. Pennington and Herman Rogenkamp, the first four of whom were the firm’s directors. The value of the firm’s property was listed at $167,520 and its equipment $91,308. The largest debt owed was to the First & Old Detroit National Bank for $170,679. Other creditors included the Russell Wheel & Foundry Company and the F.B. Ensley Co. Russell Wheel & Foundry manufactured railroad wheels, railway logging cars and structural steel light towers while F.B. Ensley Co. was a Detroit mail-order house that specialized in automotive trim and upholstery.